I hid him because I used some unauthorized art resources until I replaced them. I will spend two years to complete the game. Please pay attention to the follow-up updates. I like the minimalist pixel art style of your game. The level is very delicate and hard, but it keeps me trying and trying. It reminds me of the super meat boy that can be simple platform jump To create an infinite number design of possibilities, it would be better if you could increase the player's chances of making faults in the level design. I hope you can continue to update your game. https://ryanudairam.itch.io/ this is Ryan's page , I am very appreciate that he can compose music for the game. Of course, I am sure that I will read the topic of JAM carefully in the future and consider whether my work is related to the theme. It is because I only recently learned that itch has the function of participating in JAM, so I want to try it. I did not expect it to be regrettable. Things, but this gave me a lesson，And, I apologize for my mistakes. 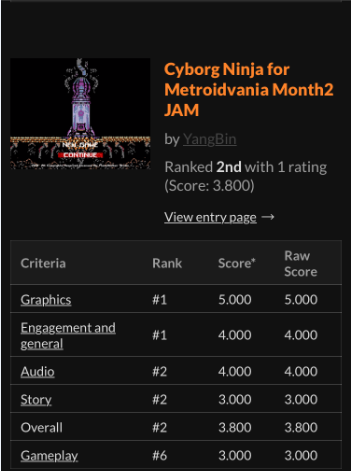 I think my account has been marked because I submitted a lot of Jams before, but I guarantee that the game submitted this time is definitely a type of Metalidvania. We spent a lot of time and energy on it, and my friends and I really hope. Please join me for this Jam, please give me some help. Thank you. Loop community · Posted in Had a lot of fun! Thank you you like it,In fact, I uploaded the project package for this game. If you open it with unity5.5, this is the final version and the sound is added. Absolutely,I will add your name to my team in this jam even in the game like "sound effect by RyanUdairam" ，and your page link。 I am so appreciate you can participate. I think next,we should discuss how to cooperate effectively to better adapt your music to the each scene in the game. for example Main menu ,Boss Battle BGM,and sound effect and so on. you Mean Credit is License fee? Metroidvania Month 2 community · Posted in Anyone still looking for a pixel artist? yeah, I like that ，so let's talk about"credit" , I NEED sound effect as well. Cool,So how do we start to cooperate?